FindItMore | Your kitchen is one of the most used areas inside your house, maintaining the sanitation of each fixture and annually replacing some kitchenware is what homeowners do to make out the most use of their kitchens. One might say that this can act as a remedy instead of remodeling and changing the whole set up of their kitchen, but, did you know that you will also spend a hefty budget when things go wrong if your kitchen starts to crumble into a series of fixture problems and low maintained equipment? Focus on your Kitchen Layout – Some homeowners might get overwhelmed when it comes to handling their remodeling project, but, creating a suitable and well-organized plan before this project will help homeowners gather as much time as they will need. Also, focusing on your kitchen layout should be included in your program since this is already present and will only need an upgrade to give you a comfortable and sanitized feeling when you are inside your kitchen. Light Up – Kitchen remodeling also suggests to homeowners that they can save their energy consumption by installing big windows that can serve as natural lighting inside the kitchen during the day. Large windows also create an aesthetically balanced environment for homeowners since this offers a more unobstructed view of their surroundings. Remodel Based on your Budget – It is essential to stick to your budget and never exceed to spend more unless it is a necessity for your remodeling project. It may seem confusing at first to manage and hire a reliable contractor to help you handle your remodeling project, but as you proceed to the process of your project, you will see progress when you had chosen the right contractor for your project. 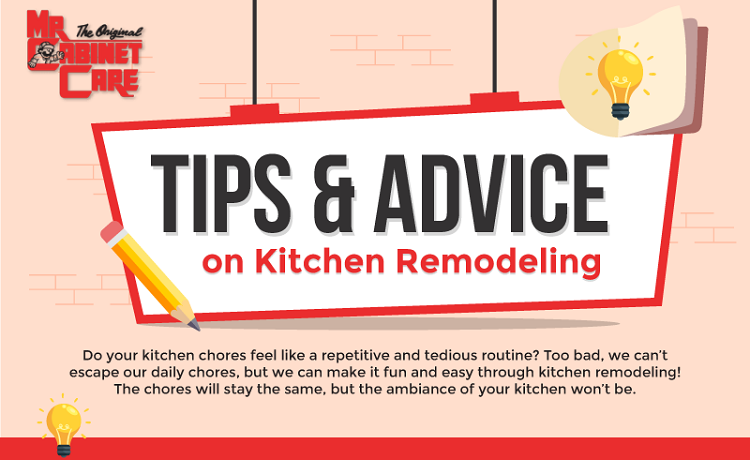 If you want to learn more about the different tips and advice when had decided to remodel your kitchen, you may check out the infographic below created by Mr. Cabinet Care. NEXT POST Next post: Lavender- A Beautiful Herb With Awesome Benefits!